Etiology of nephrotic syndrome is somewhat complex in nature. It may range from primary to secondary forms. Nephrotic syndrome patients often need immunosuppressive treatment although it has some side effects and may lead to renal disease which may be acute or severe. This review deals with herbal treatment and other recent approaches for treating symptoms of nephrotic syndrome. Nephrotic syndrome (NS) is an acute renal disorder in pediatric population. It may occur in adult population also, but pediatric population is most affected. NS is having high amount of the protein in urine and low serum albumin, abundant albuminuria, generalized edema, and hyperlipidemia. It occurs worldwide and captures at any age, but it generally occurs in initial years of life, more around 4-5 years and is more prevalent in spring season,. No specific cause has been identified yet although there are many etiologic factors for it, and the renal pathology varies for different cases, but most seen in childhood cases, in temperate climates, and renal histology by light microscopy is unworthy and of little use. These cases are known as ‘minimal change’ NS and represents vast majority of patients. ‘Minimal change’ NS or idiopathic NS covers vast literature on NS in childhood. Diseases restricted to a particular place such as nutritional oedema and urinary schistosomiasis may simulate, distort, or uncertain renal pathology, and conditions of practice make impossible the use of radiologic, immunologic investigations etc., required to identify and characterize renal disorders, thus clinical recognition of renal disease is rendered difficult,. Characterised as childhood NS, prevalent in 77%-85% of cases. Idiopathic in nature, some reports in adult cases showed an association with Hodgkin lymphoma. Renal biopsy samples when subjected to light microscopy showed no change. On electron microscopy, tissue thinning can be seen. Staining via florescence for immune complexes was negative. Prevalent in 10%-15% of cases. Light microscopy of renal biopsy sample showed sclerosis in portions of selected glomeruli, which can progress into global glomerular sclerosis. Tissue thinning was seen on electron microscopy, which was negative in most cases. NS is categorised as primary, secondary and miscellaneous ones. Primary form includes minimal change nephritic syndrome, focal segmental glomerulosclerosis and membranous nephropathy. Secondary forms includes infections-hepatitis B and C, human immunodeficiency virus, malaria, toxoplasmosis, as well as syphills. Miscellaneous forms includes systemic lupus erythematosus, immuoglobulin A nephropathy and diabetes mellitus. Drugs used are gold, non-steroidal antiinflammatory drugs, pamidronate, interferon, heroin and lithium. NS with inherited causes involves autosomal recessive type, NS type I, NS type Π and isolated diffuse mesangial sclerosis. 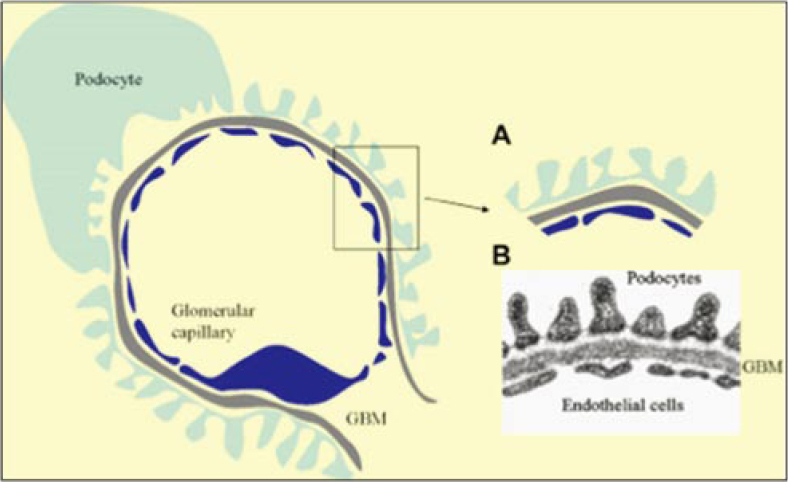 Glomerular filtration barrier has three layers that is fenestrated endothelium, glomerular basement membrane, visceral glomerular epithelium containing podocytes [Figure 1]. In NS, disturbance of the normal filtration process of glomerulus occurs, thus protein passage through filtration barrier due to three reasons including glomerular basement membrane’s defects, T-cells in the damage to podocytes leading to MCD of NS, and pathology changes according to the type of NS, [Figure 2]. Also, there were some researches carried out on NS [Table 1]. Figure 1: Pathophysiology of NS. Figure 2: Glomerular filtration barrier. Table 1: Researches on NS. NS is an acute disease, and is a MCD. 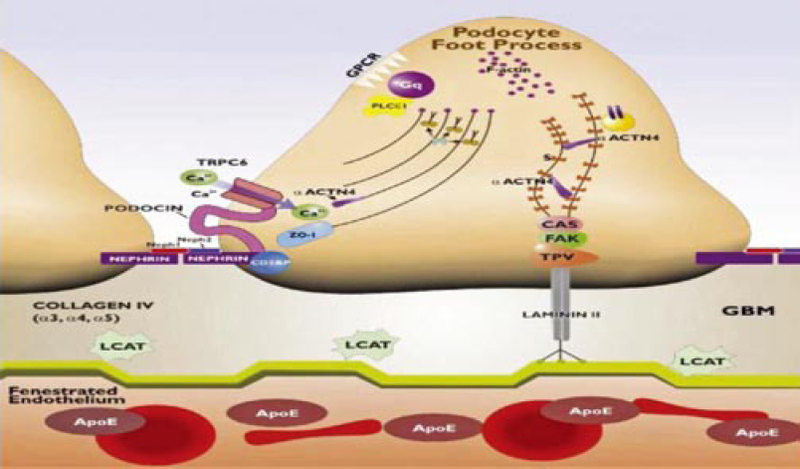 T lymphocyte dysregulation and vascular factors affecting permeability that may change podocyte function and permselectivity are marked as important features according to the research studies. Podocyte proteins coded mutations in genes have also been identified. NS patients has high risk for infections and thromboembolic episodes. Persistent hyperlipidaemia and prolonged steroid therapy comes into play. In variable population of patients, treatments with levamisole, cyclophosphamide and cyclosporine are useful differently. Steroid-resistant NS management is difficult; most patients show progressive renal damage and cannot achieve remission. Calcineurin inhibitors such as cyclosporine, tacrolimus induces remission in a particular percentage of patients, but side effects involves nephrotoxicity. Reduction of proteinuria is also possible in children using angiotensin converting enzyme inhibitors. Steroid dependence and resistance, trials are necessary. It covers more than 90% cases between 1-6 years of age. It is defined by the association of the clinical features of NS with renal biopsy findings of diffuse foot process effacement on electron microscopy and minimal change on light microscopy. Histologic findings of MCD are found in most patients, such vast majority of patients with MCD respond to glucocorticoid therapy. The association of spontaneous bacterial peritonitis with NS is common in children, but it is extremely rare in adults. Only 14 cases have been reported in the literature. Research showed two adult cases who developed spontaneous bacterial peritonitis during a course of NS, and described the clinical findings. Both patients had renal failure at admission and had a diagnosis of NS due to amyloidosis before the development of peritonitis. The causative agent could not be isolated from ascitic fluid culture in either patient. Spontaneous bacterial peritonitis is a infection caused by bacteria and is of ascitic fluid, which occurs in the absence of any other source of intra-abdominal infection. It is a common complication of childhood NS, and is rare in adults with NS [Table 2]. Table 2: Reported incidence of NS associated with thromboembolism. Normal diet was required including normal protein intake, salt restriction during relapses, limited oily foods and no junk foods and avoiding sauces with salt etc. Considering the antibiotics, oral penicillin was used during relapses to defense against pneumococcus causing infection. Use of frusemide if fluid restriction and salt restriction alone not effective in controlling oedema formation. IV albumin was used in severe oedema only, and maximum dose 1g/kg of 20% albumin over minimum for 4 h. Steroid therapy was applied when diagnosis was proved. If there is possibility of secondary NS discussion with nephrologist, it should be done prior to commencing steroid therapy. Idiopathic NS is thought to be the result of an immunological dysfunction, which brings a circulating factor thus permeability of the glomerular filtration barrier is modified. In 1974, Shalhoub proposed that minimal change nephritic syndrome was a disorder of lymphocyte function, thus increased plasma levels of a lymphocyte-derived permeability factor. For example, the response to immunosuppressive drugs and the association with Hodgkin disease and allergy. Allergy plays a role as reviewed by van den Berg and Weening. Many reports showed that some patients developed NS after having experienced allergic reactions to inhaled allergens, with vaccinations, food and insect stings. The incidence of atopy was reportedly higher in patients with idiopathic NS than in healthy subjects, ranging from 17% to 40% in minimal change nephritic syndrome patients compared with 10%-23% in age-matched control subjects. Elevated production of immunoglobulin E by B-lymphocytes occurred in case of allergy, and several researchers had reported an elevation of immunoglobulin E in the serum of NS patients. The role of circulating factor is particularly suggested by the following observations. As immunity enhancers homoeopathy medication can also be given side by side. Swiss albino mice was used as an animal model, and urotoxicity was studied after inducing acute dose of cyclophosphamide. An alcoholic extract of the plant T. Cordifolia was administered (200 mg/kg i.p.) for 5 d for reduced cyclophosphamide (CP) (1.5 mmol/kg body weight i.p.) induced urotoxicity. Morphological analysis of bladder, and also decreased urea nitrogen level in blood as well as protein in urine were evidence for reduced CP induced urotoxicity. Severe necrotic damage was reported by Histopathological analysis of the bladder of CP alone treated group whereas normal bladder was reported in T. cordifolia treated group. The study showed uroprotective role of T. cordifolia from CP induced toxicities. Rat was used as an animal model. Doses 250, 500 and 750 mg/kg of W. somnifera root extract were administered orally to rats for 14 d before gentamicin induced nephrotoxicity (GEN) treatment and thereafter concurrently with GEN (100 mg/kg) for 8 d. In GEN-treated rats, all factors such as kidney weight, urea, creatinine, urinary protein and glucose increased, body weights and potassium reduced, which was histopathologically confirmed by tubular necrosis. However, W. somnifera (500 mg/kg) significantly reversed these changes when compared to other two doses of W. somnifera (250 and 750 mg/kg), and no significant changes in the levels of sodium in the experimental animals compared to control. Results showed the nephroprotective effects of W. somnifera, which could be by enhancing antioxidant activity with natural antioxidants and scavenging the free radicals. The nephroprotective and diuretic effects of Petroselinum sativum, Eruca sativa and Curcuma longa, alone and in combination were investigated against gentamicin (GM)-induced nephrotoxicity. Animal model used was male Sprague Dawley rats. Forty two animals were randomly distributed into 6 equal groups. Rats in the first group were injected intra-peritoneally (i.p.) with saline solution (0.2 mL). Second group was injected with GM (80 mg/kg body weight) for 8 consecutive days. The other four groups were given orally aqueous infusion of the three herbs, alone and combined, (1 mL/rat, 150 mg/kg body weight) along with GM. Blood and urine samples were taken for biochemical analysis after 24 h of the last administration. For detecting oxidant/antioxidant parameters and for histopathology, kidney specimens were taken. The results showed that GM-induced nephrotoxicity characterized by renal dysfunction as evident by biochemical and histopathological alterations, elevated lipid per-oxidation and reduced activity of antioxidant enzymes in kidney tissues was ameloriated by oral administration of aqueous infusion of Petroselinum sativum, Eruca sativa and Curcuma longa herbs. It caused a nephroprotective effect evident by significant decreases in the elevated serum urea, creatinine and alkaline phosphatase activity and normalized the serum electrolytes level of sodium and potassium. It increased urine output and urinary concentration of Na+ and K+, denoting a diuretic activity. The nephroprotective effect of herbs could be due to the antioxidant effect of these herbs as evident by increasing activity of antioxidant enzymes. Thus, mixture of these three herbs are beneficial for patients having renal diseases. Results of NS as acute renal failure, edema, hypercoagulation, and infections should be treated and dealed properly. Immunosuppressive drugs can be used to prevent relapses. However, recent experiments have shown that steroids and cyclosporine, may also act directly on the podocyte to stabilize its structure,. Major advances in the pathophysiological understanding have led to new treatment strategies in the past several years, even though the occurrence of primary causes of NS is low. Therefore, clinical trials should be done, and adult patients with NS should be treated with clinical trials in the future. Many new treatment targets identified by basic science have been proposed. More study of these new targets and those identified in the future will potentially lead to novel advances in the treatment of NS, with higher effectiveness in reducing proteinuria. Bagga A, Ali U, Banerjee S, Kanitkar M, Phadke KD, Senguttuvan P, et al. Management of steroid sensitive nephrotic syndrome: Revised guidelines. Indian Pediatr 2008; 45(3): 203-214. Hendrickse RG, Adeniyi A. Quartan malarial nephrotic syndrome in children. Kidney Int 1979; 16(1): 64-74. Morel-Maroger L, Saimot AG, Sloper JC, Adam C, Niang I, Payet M. Tropical nephropathy and tropical extra-membraneous glomerulonephritis of unknown etiology in Senegal. Br Med J 1975; 1: 541-546. Allison AC, Hendrickse RG, Edington GM, Houba V, De Petris S, Adeniyi A. Immune complexes in the nephrotic syndrome of African children. Lancet 1969; 1: 1232-1238. Houba V, Lambert PH, Voller A, Soyanwo MA. Clinical and experimental investigation of immune complexes in malaria. Clin Immunol Immunopathol 1976; 6(1): 1-12. Lennon RL, Massengill SF, Yao L. Nephroti syndrome in children. Lancet 2010; 362: 36-42. Gipson DS, Massengill SF, Yao L, Nagaraj S, Smoyer WE, Mahan JD, et al. Management of childhood onset nephrotic syndrome. Pediatrics 2009; 124(2): 747-757. Arant BS Jr, Singer SA, Bernstein J. Steroid-dependent nephrotic syndrome. J Pediatr 1982; 100(2): 382-333. Gulati S, Kher V, Elhence R, Kumar P, Sharma RK, Gupta A. Treatment of nephrotic syndrome. Ind Pediatr 1994; 31(2): 165-170. Haas ME, Levenson AE, Sun X, Liao WH, Rutkowski JM, de Ferranti SD, et al. The role of proprotein convertase subtilisin/kexin type 9 in nephrotic syndrome-associated hypercholesterolemia. Circulation 2016; 134(1): 61-72. Singhal R, Brimble KS. Thromboembolic complications in the nephrotic syndrome: Pathophysiology and clinical management. Thromb Res 2006; 118(3): 397-407. Caridi G, Perfumo F, Ghiggeri GM. NPHS2 (Podocin) mutations in nephrotic syndrome. Clinical spectrum and fine mechanisms. Pediatr Res 2005; 57(5 Pt 2): 54R-61R. Moulin P, Appel GB, Ginsberg HN, Tall AR. Increased concentration of plasma cholesteryl ester transfer protein in nephrotic syndrome: Role in dyslipidemia. J Lipid Res 1992; 33(12): 1817-1822. Lewis MG, Loughridge LW, Phillips TM. Immunological studies in nephrotic syndrome associated with extrarenal malignant disease. Lancet 1971; 2(7716): 134-135. Hinkes B, Wiggins RC, Gbadegesin R, Vlangos CN, Seelow D, Nürnberg G, et al. Positional cloning uncovers mutations in PLCE1 responsible for a nephrotic syndrome variant that may be reversible. Nat Genet 2006; 38(12): 1397-1405. Vernier RL, Klein DJ, Sisson SP, Mahan JD, Oegema TR, Brown DM. Heparan sulfate-rich anionic sites in the human glomerular basement membrane. Decreased concentration in congenital nephrotic syndrome. N Engl J Med 1983; 309(17): 1001-1009. Joven J, Villabona C, Vilella E, Masana L, Albertí R, Vallés M. Abnormalities of lipoprotein metabolism in patients with the nephrotic syndrome. N Engl J Med 1990; 323(9): 579-584. McCarthy HJ, Bierzynska A, Wherlock M, Ognjanovic M, Kerecuk L, Hegde S, et al. Simultaneous sequencing of 24 genes associated with steroid-resistant nephrotic syndrome. Clin J Am Soc Nephrol 2013; 8(4): 637-648. Bagga A, Mukta M. Nephrotic syndrome in children. India J Med Res 2005; 122: 13-28. Habib R, Kleinknecht C. The primary nephrotic syndrome of childhood: Classification and clinicopathologic study of 406 cases, in Pathology Annual. In: Sommers SC, editor. New York: Appleton-Century-Crofts; 1971. White RH, Glasgow EF, Mills RJ. Clinicopathological study of nephrotic syndrome in childhood. Lancet 1970; 1(7661): 1353-1359. Research Support, Non-U.S. Gov’t. The primary nephrotic syndrome in children. Identification of patients with minimal change nephrotic syndrome from initial response to prednisone. A report of the international study of kidney disease in children. J Pediatr 1981; 98(4): 561-564. Chuang TF, Kao SC, Tsai CJ, Lee CC, Chen KS. Spontaneous bacterial peritonitis as the presenting features in an adult with nephrotic syndrome. Nephrol Dial Transpl 1999; 14: 181-182. Chen MC, Lam KK, Hsu KT. Spontaneous bacterial peritonitis in adult patients with primary nephrotic syndrome. Changgeng Yi Xue Za Zhi 1999; 22(2): 227-233. Hamed RM, Shomaf M. Congenital nephrotic syndrome: A clinicopathologic study of thirty children. J Nephrol 2001; 14(2): 104-109. Kerlin BA, Blatt NB, Fuh B, Zhao S, Lehman A, Blanchong C, et al. Epidemiology and risk factors for thromboembolic complications of childhood nephrotic syndrome: A Midwest Pediatric Nephrology Consortium (MWPNC) study. J Pediatr 2009; 155(1): 105-110. Cherng SC, HuangWS, Wang YF, Yang SP, Lin YF. The role of lung scintigraphy in the diagnosis of nephrotic syndrome with pulmonary embolism. Clin Nucl Med 2000; 25(3): 167-172. Wysokinski WE, Gosk-Bierska I, Greene EL, Grill D, Wiste H, McBane RD 2nd. Clinical characteristics and long-term followup of patients with renal vein thrombosis. Am J Kidney Dis 2008; 51(2): 224-232. Wong W, Prestidge C. Nephrotic syndrome in childhood. Starship Children’s Health Clin Guid 2013: 1-5. Shalhoub RJ. Pathogenesis of lipoid nephrosis: A disorder of T cell function. Lancet 1974; 2(7880): 556-560. Van den Berg JG, Weening JJ. Role of the immune system in the pathogenesis of idiopathic nephrotic syndrome. Clin Sci 2004; 107(2): 125-136. McCarthy ET, Sharma M, Savin VJ. Circulating permeability factors in idiopathic nephrotic syndrome and focal segmental glomerulosclerosis. Clin J Am Soc Nephrol 2010; 5(11): 2115-2121. Hamsa TP, Kuttan G. Tinospora cordifolia ameliorates urotoxic effect of cyclophosphamide by modulating GSH and cytokine levels. Exp Toxicol Pathol 2012; 64(4): 307-314. Singh RG, Singh P, Singh PK, Usha, Agrawal A, Upadhyay BN, et al. Immunomodulating and antiproteinuric Effect of Hippophae rhamnoides (Badriphal) in idiopathic nephrotic syndrome. J Assoc Physicians India 2013; 61(6): 397-399. Pathak NN, Rajurkar SR, Tarekh S, Badgire VV. Nephroprotective effects of carvedilol and Curcuma longa against cisplatin-induced nephrotoxicity in rats. Asian J Med Sci 2014; 5(2): 91-98. Faul C, Donnelly M, Merscher-Gomez S, Chang YH, Franz S, Delfgaauw J, et al. The actin cytoskeleton of kidney podocytes is a direct target of the antiproteinuric effect of cyclosporine A. Nat Med 2008; 14(9): 931-938. Xing CY, Saleem MA, Coward RJ, Ni L, Witherden IR, Mathieson PW. Direct effects of dexamethasone onhuman podocytes. Kidney Int 2006; 70(6): 1038-1045.